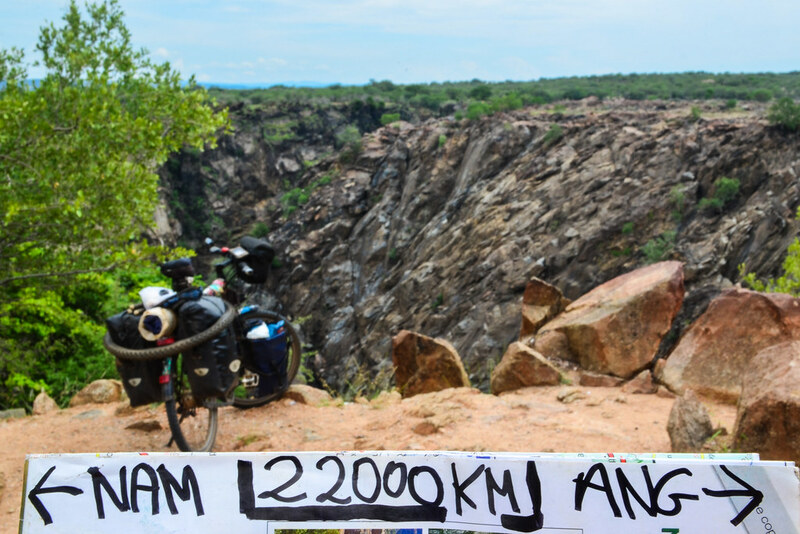 I am reaching 22000 KM just as I exit Angola after close to 3000 kilometers in the country. I think I took all the worst roads I could there. Angola was very beautiful, I’d say it has the most stunning landscapes I have seen since Morocco. I am now at Ruacana falls, right at the border, and I am not stamped into Namibia yet. With all the rain of the previous days, I am surprised the falls are completely dry. It should be looking like a small version of the Victoria falls. It’s Saturday, Namibians are drinking here with their Toyota pick ups and nice clothes. The roads will have tar, the cities will have electricity and hopefully the restaurants will have real meat. Maybe it’s for me the end of “real Africa”… Though I’m sure I will still end up on dirt roads with more hard time to come. Namibia is also huge country to cross, but so close to South Africa in many ways. Bientôt plus qu’une frontière à traverser, tu y es “presque”…et c’est fou quand je pense, tous ces kilomètres que tu as parcourus depuis Zurich….Bravo et bonne route pour traverser la Namibie (où tu vas peut-être croiser mes voisins en voyage de noce mais motorisés eux ;D), cet immense et dernier pays avant l’Afrique du Sud. Et cela te fait quoi de penser que tu te rapproches de ton but ?